What’s different about the Burnie Glacier Chalet? There are 27 backcountry lodges in B.C. Why should I come all the way to Smithers, halfway up the province, to ski? Try exceptionally big, bold, good terrain. Long, often steep runs and interesting summit ascents. Try a professional ACMG guide and small groups (usually no more than seven per guide). Think lots of snow – good and reliable. Think of a season from December to May, each week with its highlights and special rewards. Think the beauty of a locally crafted lodge that was built with permission of the First Nation on whose territory it is. Think of a new park that protects this unique place. Think great food and a wonderful wood-fired sauna. Then you may come close, but the reality is much better. And how about your spirit of adventure? How about learning to know a range of mountains that you barely knew existed? You might want to come back to the Bulkley Valley not just for the skiing and climbing, but as well for its rich local music, food and community spirit. Besides, getting here is cheaper and easier than you think. There are several direct daily flights from Vancouver, there is Highway 16, and there is VIA Rail and the Inside Passage ferry for those who want to travel in style and splendour. Think about it: to which other lodge can you start in the morning from Vancouver and ski there the same afternoon? No rental car costs, no long drives. Just a 1.45 hr flight to Smithers, a hop across town to the heli base, and you’re home. You pay less and ski more. Why should I come on a guided trip? The price includes your flight to and from the lodge, all meals and snacks, your accommodation at the lodge, a professional guide’s services, local transportation and rental equipment you may need. Not included is your trip to Smithers, your stay in Smithers, alcoholic beverages at the lodge, your personal equipment and 12% Harmonized Sales Tax. The food is excellent and plentiful. Don’t worry: the guides don’t try to cook as well! There is a person dedicated to this important task. We are happy to accommodate different preferences: vegetarian or meat, bacon-and-eggs or muesli … Breakfast is usually muesli with fresh homemade yogurt and fruit and/ or pancakes. Coffee is ground fresh. We feature our own baking or carry very good bread from Foxhole Bakery in Telkwa. Your pack lunch may contain ham, cheese, fruit, bread, chocolate or Ursula’s famous granola bars. When you come back from the day, there is a tasty snack. Then you may want to visit the sauna, after which you should be hungry again for a dinner featuring fish, chicken, meat, vegetarian dishes, salad, and a great dessert. There is no doubt: our place will be most enjoyed by reasonably fit people. The Howsons are big mountains, and trips are rarely less than 1200 vertical metres (4000 feet) per day. You will often ski much more in a day. Some trips require a bit of boot climbing in a steep section. Many are on glaciers and will require roped travel or wearing a harness. However, we usually form two groups to accommodate all abilities. You do not need to be super fit to have fun here! And we do offer introductory courses and trips. Please talk to us. What if I am the slowest person? Don’t worry, many people have this question. We are not out there to break speed records. We are not out there to compete against one another. We are out there to live life to the fullest together. Every member in our groups will be respected and their pace accommodated. How many people come on the trips? There is a maximum of 11 guests at the lodge. The trips and expeditions are usually much smaller. We rarely have groups of more than eight, and often there is only one or two guests with a guide. What is the best time or season to come? That depends. The early winter season tends to have powder, and lots of it. As the winter progresses, days become longer and a bit warmer. The overall stability tends to increase. Starts get earlier, until by May we are often on the way at 5 am with ski crampons on and ice axes on our packs to climb peaks and ski corn. Each part of the winter has its own rewards and challenges: I could not say what time is best. In the summer, conditions usually allow summer style ascents by July. As the summer progresses, the rocks become drier, but the crevasses more open and the ice harder. Wildflowers are in full bloom in August. Yet even October can be wonderful with fall colours, thin snow on the peaks and mushrooms in the forest. Our traverses and expeditions take place in the spring. It will be cold and snowy at times, but so far north it will always be light. Sometimes (but only in the summer!). Some years there are almost none, and others there are many. The lodge site is windy enough to keep them down, and once on the glaciers they tend to become very few. What repellent do you recommend? More than repellent, we recommend appropriate clothing. Have light and loose long sleeved shirts and pants with you. We have bug headnets for you to use if the air becomes still or if we are hiking through a forest after a hatch. Most folks say that anything with DEET as the active ingredient is good. It is very strong stuff, so we prefer to apply it on a hat or other outer clothing. At the lodge, each bed is equipped with no-see-um netting. You will sleep well. When do the trips start to fill? Some trips fill months ahead of the departure date and some can be booked the day before! But that is rare: we do need advance notice. If you have a very specific time in which to take your holiday than we recommend that you reserve space on the trip that suits you while you make your travel arrangements. In this way you will avoid the disappointment of having your preferred date fill before you get a chance to book it. Can we rent the lodge without a cook and guide? This year two people were killed in an avalanche after they decided to decline my services. I have also had quite a few groups who were disappointed because they found the place was too big for them. Restricted to a few runs, they did not do much skiing. Or they precariously waded the raging Burnie River in the summer only to find the bridge after a good bushwhack …These are big and serious mountains. It is all too easy to get into trouble in them. A fair amount of mountaineering skills and experience are needed to move safely through them. Guides add to your experience and understanding of this incredible place by sharing their knowledge and love for the area and guiding you safely through it. So unless I know you and feel confident with your level of skill and judgment, no. What time will we be back on the last day of our trip? We schedule our flights in the early afternoon. That way, the outgoing group can still shred a run in the morning, and the incoming group can go on a leisurely little trip to get acquainted with the place and to do their beacon training. You will be back in time to catch a flight after 5 pm. What are the sleeping arrangements in the lodge like? The lodge has three stories, one of which is buried in the winter. There is a private two bed room on the second floor. The upstairs has a family room with a double and a single bed, a room with three and one with four beds. While the walls are simple wood walls, all rooms have doors and windows. What size pack do I take? We always tell people to take a good look at the equipment list, decide what to bring, fill a backpack and if there is room for something extra on top then you have a great pack size! Also, it is better to have a bigger well fitting pack with a good waist belt that is comfortable then a lighter smaller pack that is not comfortable. How you carry your gear is as important as how much you carry! If you have a light pack that is ill fitting or not offering the support for the load that you need you will be much more tired than if you had a well fitting, more supportive, bigger pack. 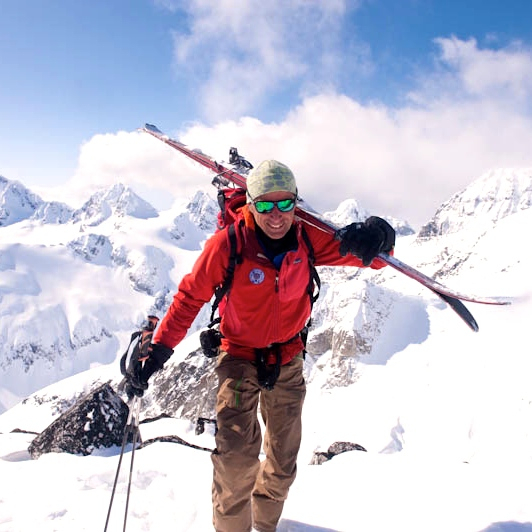 Your pack should allow you to strap skis to its sides and to carry an ice axe.